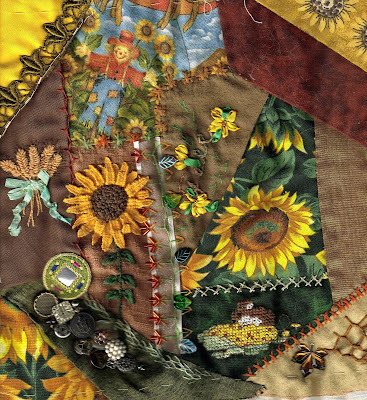 Rosa's block was so much fun with it's Fall & Sunflowers theme! 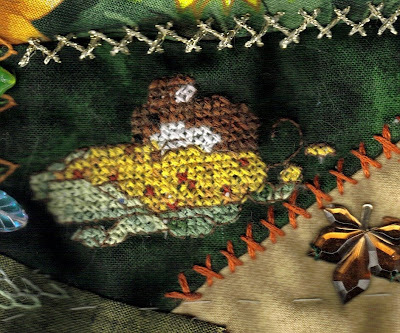 The third motif I added to the block was this little cross stitch mouse nibbling on an ear of corn, using waste canvas. 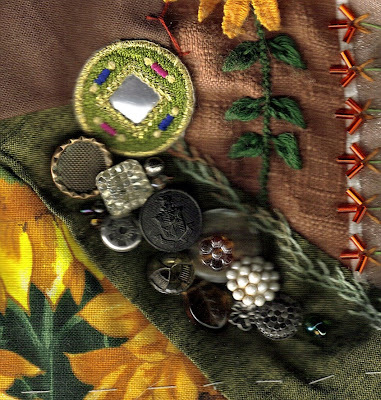 I added a button trail on one patch using vintage buttons made of metal and glass and a few beads. They appear very dark in the picture but actually they are a bit brighter and seemed to fit the block. This is the whole block after two of us have worked on it. 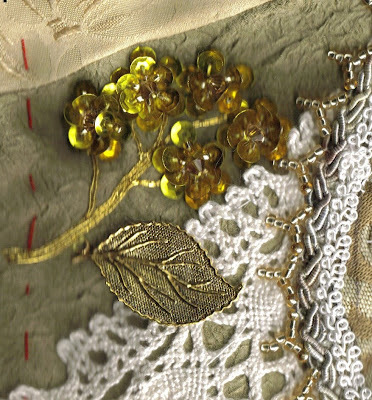 I did a few seams as well: one double feather stitched one, a gold metallic herringbone, some green lace with gold bugle beads and a rust coloured cretan stitch. This block is off in the mail this morning to it's next destination to be stitched on some more. This weekend I have been working on Rosa's block for the CQI Novice Anything Goes Round Robin. Rosa's block is all sunflowers and autumn so I have been trying to stay with that theme. As soon as I saw the block I knew the first thing I wanted to attempt was the sunflower from Pat Trott's wonderful Three-Dimensional Embroidery Stitches book. This sunflower included three stitches new to me: Palestrina knot stitch for the stem, woven picots for the petals and raised leaves. These leaves are the coolest stitch and I will be using them a lor from now on! I also enjoyed the woven picots and can see where they will be very useful in a lot of applications. 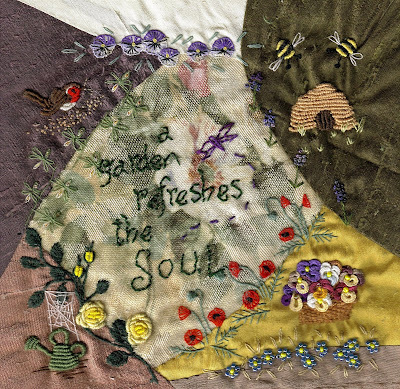 The center of the sunflower is good old french knots. The second motif I did for Rosa is a bunch of wheat. 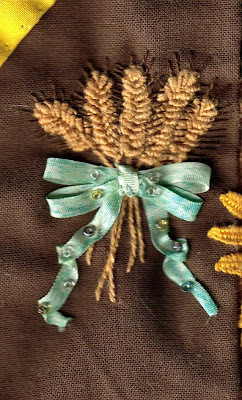 This time I just winged it - found a photo of wheat that I liked and then used stem stitch, bullions and straight stitch to replicate the photo and tied it together with some silk ribbon. I took license with the photo since I am very fond of bearded grain from my brief dabbling into wheat weaving years ago so I added the beards to the kernels of grain. I'm pretty happy with how it all worked so far - hope Rosa will like it too! I have another motif I will be working on today and then a few seams and it will be ready for the mail, hopefully about the same time the weather breaks here. 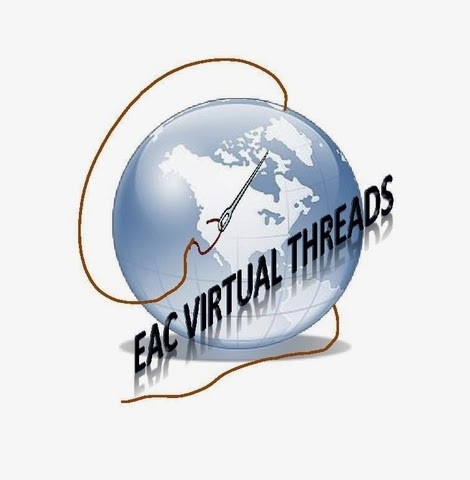 We are having a week of winter weather here in April, cold temperatures, lots of snow and treacherous road conditions - a great time to stay home and stitch! I had a lot of fun with Gerry's block and finally finished up my work last night. I could have just kept going... The little round lace was ringed in gold beads by Simona and I thought it was the perfect place to put this little angel I wanted to use. She was part of a piece of jewelry from the thrift store - I liked her size but she still managed to look delicate. 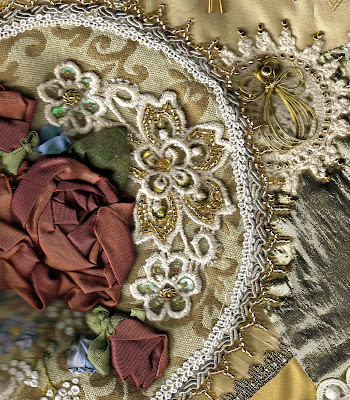 I did some work on the central motif Gerry did on her block - used beads and sequins to tart up the lace there next to Gerry's gorgeous silk flowers. I did a couple of seams in the bottom corner. I had some antiqued gold trim with sequins and beads - found it in the odds and ends bin at a sari shop and could only get that six inches. I added another gold trim on top and then did some beadwork on top of that. 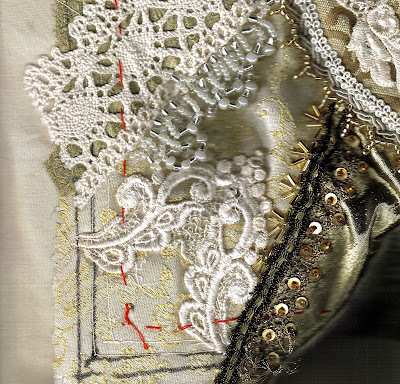 The other seam is a beaded fringe I built following one of the patterns in the A - Z of Bead Embroidery book. This motif is a branch with the stem made from japanese gold thread I couched down. Then I added the sequin and bead flowers that I have fallen in love with lately. There was a big space left so I added a metal leaf. This beaded round robin is very enjoyable and I can't wait to see what challenges the next block brings with it! First of all, I better say I can't take credit for the dragonfly in this picture - this lovely little creature was created by Simona, who had the block before me. Gerry has requested lots of gold and glitter on this block so it is fun watching it develop. The picture doesn't pick up the way everything glitters so you have to use a bit of imagination. In this portion of the block I did a beaded feather stitch on the little seam. 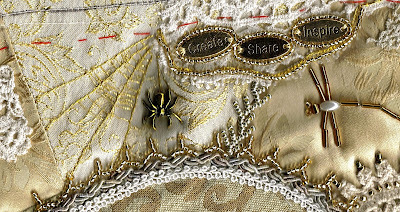 On the little piece of lace at the top I added three little metal charms that were perfect for Gerry in my mind. They say "Create - Share - Inspire" and that is what Gerry does on CQI! Her work is always an inspiration. I surrounded the charms with an oval of gold beads. To the left of that I built a small spider web and added a gold spider charm for luck. Leslie was kind enough to let me do one of her 6" blocks for her and from the start it told me it wanted to be a garden. I have finished the block now and have learned some new stitches along the way so it was really a lot of fun! Hopefully Leslie will like it as much as I do - lol. The challenge this month at CQI is flowers using a new stitch or technique so I have accomplished a couple of these on this block. The pansy seam at the top with the buttonhole circles was a new one. The bullion roses were a first for me as were the cast-on pansies in the basket. 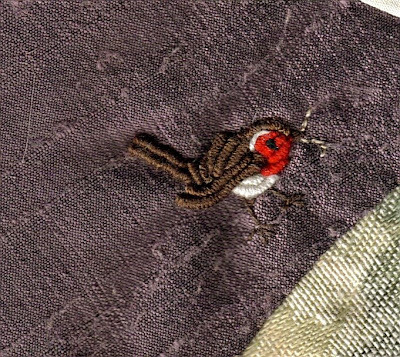 Up by the robin there is a seam treatment of orchids and I used buttonhole to make the poppy treatment at the bottom. So, that was four new flowers. 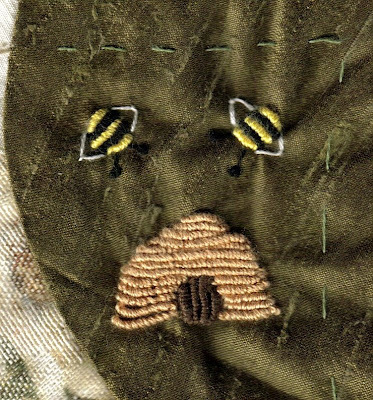 Still using boullion stitches and A - Z of Bullions, this time I did a beehive and a couple bees. I just can't get over how much I like these bullions! I'm not too sure about the fly stitch wings on the bees - I think I would prefer a rounder wing so I may still change that. But I love their fat little bodies. The longer boullions on the beehive gave me a bit of trouble and I think I should couch them down in spots. This little block has been talking to me and it tells me it definitely is a garden block. 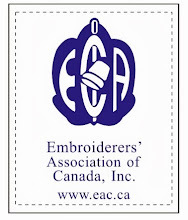 So, it will be lots of flowery seams coming up!